Marblehead, AKA OH HEY BIKES. I haven’t raced my bike since Mayor’s Cup. Since 2005 I’ve raced cross, but then 2012 was a busy year and I had to choose between “racing bikes” and “being a functional human being”. So it was a long time between bike races, and though one would expect me to be SUPER ABSURDLY EXCITED about Marblehead, I was just MARGINALLY EXCITED, because maybe I am becoming an old person. But if I’m becoming an old person, maybe I’m getting old man power, so it’s really okay. I rode from my house to a McDonald’s in Amesbury to meet Ryan Fleming and new teammate but dude you all know Aaron Hubbell. We drove to the bike race while they marveled at my collegiate-level foolishness to not bring a change of clothes with me. Listen, when you have size 15 feet, you really don’t want to ride bikes with a pair of shoes and street clothes. It’s terribly annoying. Plus my shorts are pretty comfortable and I had on some chamois cream, so…whatever. Upon arrival at the sandy parking lot of Marblehead, Peter Bell came up to us like some sort of beardless Santa with a sack of new clothing, and that was great. I love new clothing, especially when it includes well-fitting long-sleeve jerseys, as a good portion of my bike riding is spent in the morning hours when long-sleeve jerseys are my friend. After the usual pre-race business of chatting and riding and discussing whether or not it was an appropriate temperature to go bare-knees (it was not, but don’t tell Luciano that, because he’s all “you guys check out my legs!”), the racing started! YAY BIKE RACING I HAVE MISSED YOU. It was not warm, which is normal at Marblehead. Marblehead is a strange race, because the promoting club CCB throws everyone who owns a CCB jersey at it. So, when there’s a move up the road with a CCB rider, you aren’t immediately sure if it’s watt-factory Tim Mitchell or some dude who is normal. Then, CCB also has Cameron Cogburn (winner of 2012 Mt. Washington Hill Climb), Dylan McNicholas (dude who spends every Wednesday night in the summer making me question my life decisions), Will Dugan (former Team Type 1 rider) and a pile of other dudes who they also just send off the front to make it interesting. So you’re never really sure what’s going on, it gets sorta fast, and everyone is super excited because OH MAN WE ARE RACING BIKES! The race saw a few moves go up the road and come back, and things were pretty normal until three to go when Tim Mitchell (aforementioned watt factory), a Keough (yep, one of them Keoughs) and another dude were up the road. 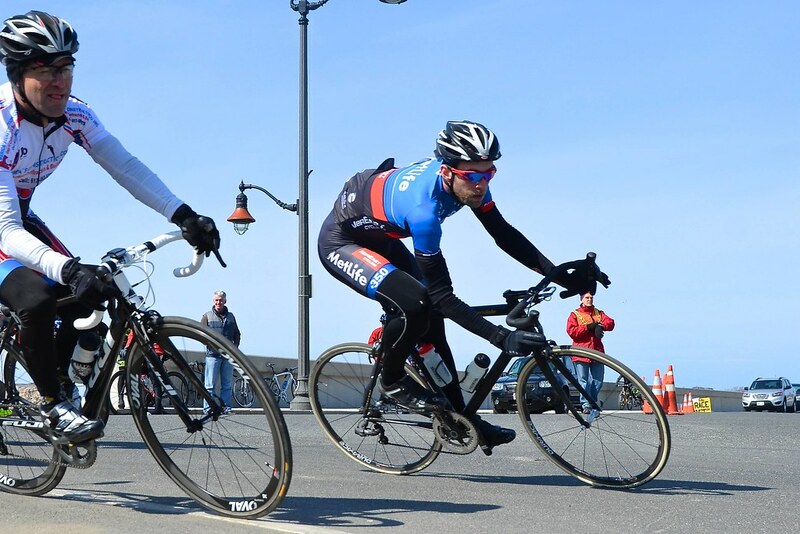 I was getting to the point where I wanted to take a nap, as I had spent some time at the front of the race being excited, but once I saw Ryan Fleming at the front riding with gusto I realized I should try to be productive. We spent a lap riding at a lively pace – lively enough that my legs and respiratory system started getting confused with what was happening – before I detonated at the bottom of the finish climb at one to go. Fleming eventually blew up shortly thereafter. Luciano ended up 6th, and Aaron 8th (full results – please note the fantastic finish of Ryan Fleming and I! ), so that is dandy.